It takes a special kind of community to support a farmer who wants to take an acre-and-a-half, road-base parking lot and nurture it into an urban farm with biodynamics. 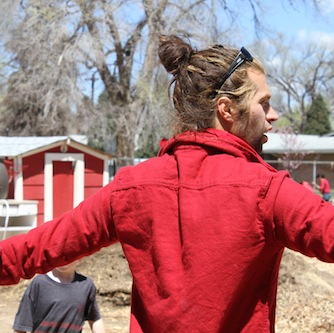 At Mountain Song Community School, a public charter school that follows Waldorf methods in Colorado Springs, Colorado, such a community exists and is pulling together to raise awareness concerning a priority for all of us — our food and how its grown. Now, when you want to grow things au naturale, you need soil. And if you don’t have it, you grow it — at least that’s what this farmer thinks. To do that, we started our first year with sixty straw bales, sprayed them with Demeter-certified nutrients from Progress Earth, and grew a small amount of produce directly in those bales. Come December, that used straw was the base for our fifteen-foot-diameter by seven-foot-tall compost windrow. 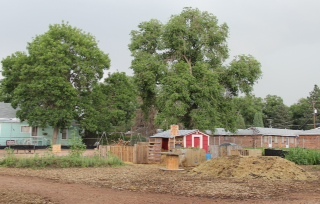 The other main contributor was compost from our all-organic food program, layered with the used bedding and animal manure from our chickens, rabbits, and goats. That pile had the biodynamic preparations inserted into it this May, was turned the end of June, and will be used in September. We also ordered our first-year seeds from Turtle Tree Seed and started the preparation plants immediately, thinking that as much as possible should come from our farm. The preparation plants were transplanted into two circles twenty-five feet in diameter, where we slowly but surely, by hand, used a pickaxe and shovel to get down to the clay. We amended those circles with some local, organic, and free compost, and we are slowly developing the circles into our permaculture food forests. Along with the preparation plants and asparagus, rhubarb, and horseradish, we have a variety of herbs, most of which are grown with the intent of being the herbal first-aid kit for our critters. 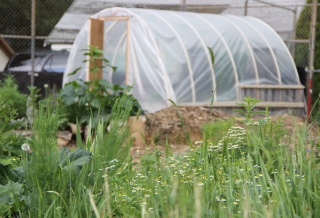 We grow calendula to make an udder salve, wormwood to keep the worms at bay, garlic for its antibacterial properties, and raspberry leaf for birthing and lactation, among others. For the time being, the food we grow is given to our weekly volunteer families, and a larger amount will find its way to our cooking arts classroom, giving the children a true “farm to table” experience. 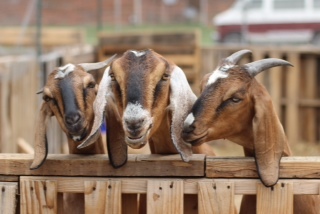 A goal this year is also to grow a small amount for our animals, which means growing amaranth, other grains, and sprouts for our chickens; keeping weeds in check with our rabbits; and having the children make the stalks from the corn, along with other plants, into silage for our goats. 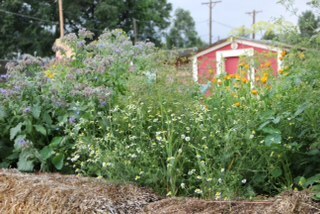 Starting our second year, we are fortunate to have our valerian flowering, to have been gifted twelve horns from a local natural rancher to make preparations 500 and 501, and to have a community that is curious about biodynamics. By the end of the year, we should be successful in burying all of our preparations, and all the plant matter (except for the oak bark) will have come from our parking lot, our paradise, our farm. We welcome you to join us on Facebook to watch us grow! This year is shaping up to be full of lots of Biodynamic goodness.